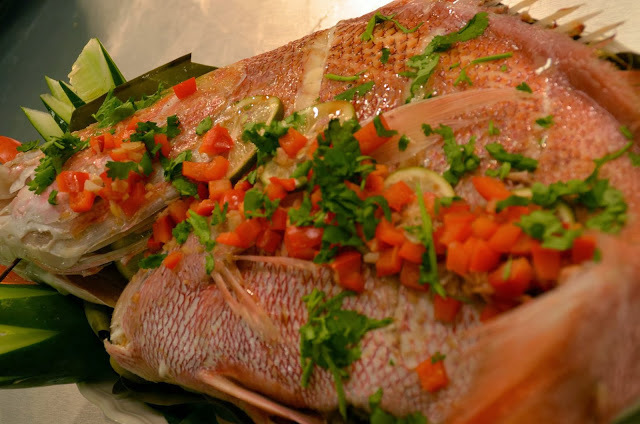 Giant Steamed Maya-Maya with Chili Sauce has very little cholesterol content, which makes it ideal as a birthday offering for our lolos and lolas. It has a truly flavorful blend that comes from the combination of tamarind paste, lime juice, brown sugar, garlic, cilantro, fish sauce - and more. Very Asian in texture, aroma and flavors. 1. Prepare fish by rinsing it, then patting it dry. Make diagonal cuts into the side of the fish. 2. Squeeze the juice of 1-2 lime or lemon over and inside fish. Place pounded lemongrass and ginger inside the fish. Sprinkle surface with salt and pepper, set aside while you prepare the sauce. 3. Place water, tamarind paste (or lime juice + soy sauce), garlic, sugar, ginger , cilantro, chili, and fish sauce in a food processor. Process well (or chop and mix by hand). 4. Pour the sauce into a sauce pan. Add the diced pepper and simmer over medium-low heat for 5-8 minutes. Season with salt and pepper, adjust sweetness and/or sourness depending on your preference. 5. Steam the fish until done. 6. To serve, plate the fish and pour the sauce over. Garnish with sprigs of fresh coriander and wedges of lime. Serve with rice.